We all look online for recipes now and again - even experts such as myself. But after searching for hash brown recipes, I felt somewhat disappointed. 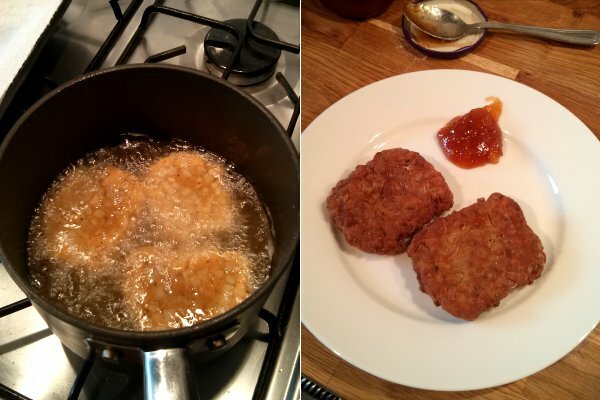 All the recipes I saw were for pan-fried grated potato patties - which I'm sure taste great, but to me, that's a potato rosti, not a hash brown. 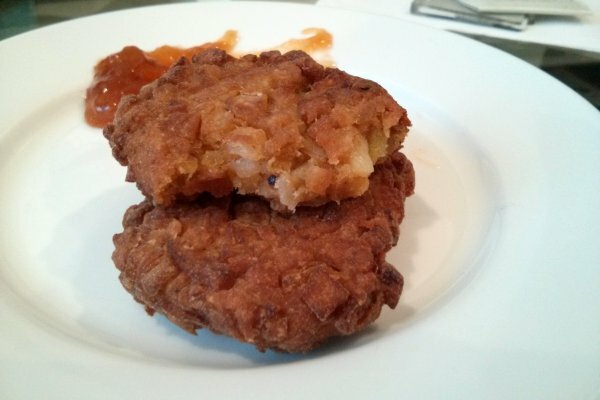 I wanted to make the kind of hash brown you get at a greasy spoon, or with a McD's breakfast. The best way I can describe one of these hash browns would be finely diced potato, stuck together with "potato glue", and deep fried. It sounded doable. But then I had a brainwave - to combine the hash brown with the flavour of everybody's favourite (well, certainly my favourite) potato dish, Bombay Potato. 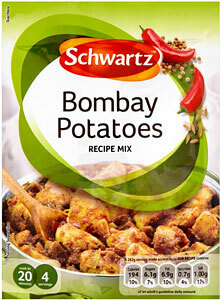 What I needed was one of these - a packet of "Bombay Potatoes recipe mix". Yes, you could of course use your own mix of spices, but I thought that the Schwarz mix had a certain comedy kitsch value. But despite finding plenty of evidence for this product's existence online, after searching three separate supermarkets, I still had not found it. 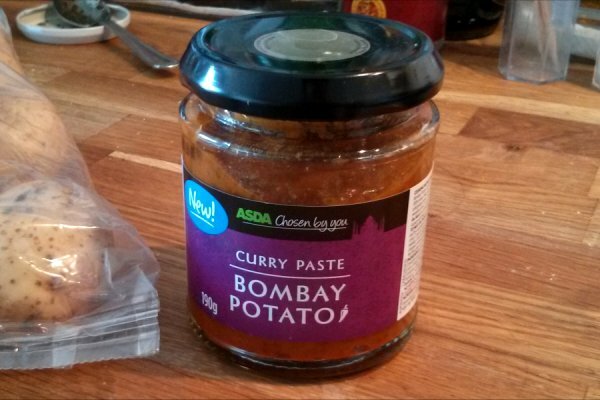 The best I could do was a jar of Asda bombay potato curry paste. So I made my "potato glue" out of mashed potato, flour, egg, and the bombay potato curry paste. This stuff was sticky and horrible - leaving it in the fridge to dry for a few hours helped a bit, but not much. 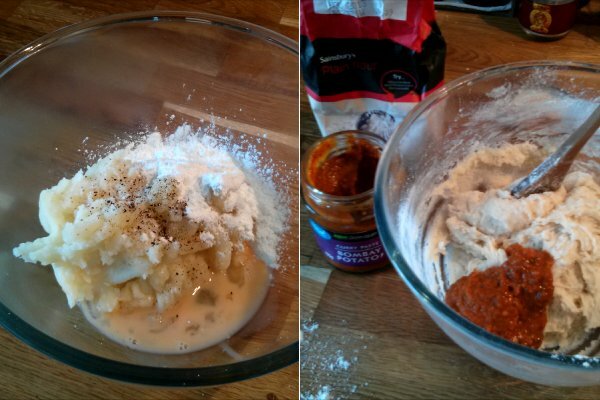 But I added a bit more flour and some extra dried spices, and it was just about workable. 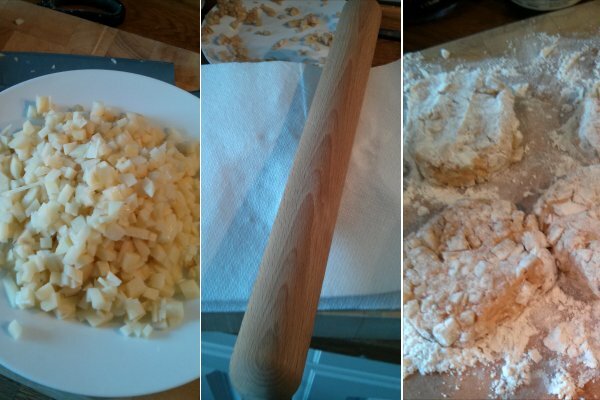 Next I diced some potatoes as finely as I could, and then tried to squeeze the moisture out using a rolling pin. It was a particularly satisfying experience to feel the little cubes of potato popping like bubble wrap. I mixed the diced potatoes with the "potato glue", formed the mixture into squares, and it was ready for deep frying. Fresh, crisp hash browns, with a spicy curry flavour. A bit of mango chutney on the side, and you can't go wrong.